The 10 Best Taco Places in Arizona! Arizona’s taco joints serve some of the most authentic offerings in America. The state is full of legendary taco shops that make locals salivate. Tasty carnitas, fresh guacamole, and insane hot sauces are just some of the signature items you’ll find at these taquerias. So next time you’ve got a craving, check out these 10 great taco places in Arizona. It’s old world versus new world at Taco Guild. This renowned gastropub infuses old-school recipes and new styles to make their tacos. Taco Guild uses local farm ingredients and house-made corn tortilla, flour tortillas, or fresh torn lettuce cups for their tacos. Old-world favorites include the al pastor pork and urban bean coffee braised beef. Their new world items include Yucatan shrimp, chipotle cherry steak, and Peking duck. Located in a restored 19th century church, Taco Guild combines a unique setting to pair with their insanely delicious tacos. Aqui Con el Nene brings Mexican street tacos to Arizona. There’s nothing fancy about this Tucson taco stand. You’ll feel like your eating on a street corner in Mexico while diving into delicious carne asada tacos. Aqui Con el Nene specializes in simple, well seasoned tacos. 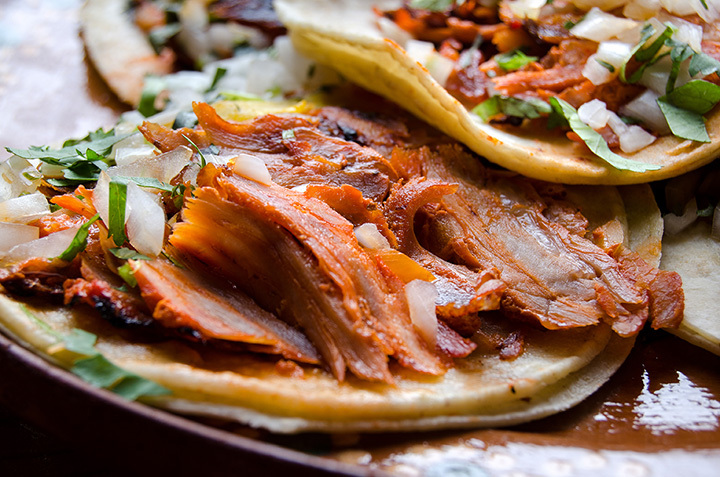 Their street tacos are served on flour or corn tortillas with carne asada, chicken, or marinated pork. The authentic tacos are also less than $2 each. You can add spicy extras or additional toppings at their salsa bar. La Santisima serves up tasty street tacos with flavors from all over Mexico. Their menu is infused with flavors from Baja, Cancun, Sierra Madre, and Mexico City. Their fresh local ingredients include the likes of chipotle chiles, Oaxacan cheese, and green tomatillos. The tacos are served on Mexican flour and corn tortillas and can be topped with fresh toppings at their salsa bar. Mi Nidito has been serving up authentic Sonoran tacos to the Tucson community since 1952. This family-owned restaurant may be on its third generation, but their signature tacos have remained the same. Their tacos are served on a fried tortilla with shredded lettuce and cotija cheese. You’ll have your choice of ground beef, rolled chicken, dried beef or the meatless health taco. Mi Nidito has remained popular by serving up true Mexican flavors and staying true to their menu. BK Tacos is known for many things. Their menu is packed with authentic Mexican and American fare like the Sonoran dog, caramellos, and carne asada tacos. BK’s distinct carne asada tacos are cooked over mesquite fire and served on fresh tortillas. The tacos are served fast and hot and without any frills. You can top the tacos off at the decadent salsa bar. BK’s has become a Tucson favorite by selling flavorful, authentic tacos. It’s hard to resist Karamelo King. This food truck lures you in with its tantalizing smell, addictive tacos, and low prices. Located in the parking lot of a piñata and candy shop, this late-night staple has some of the best carne asada tacos in the state. They’re served on thin corn tortillas with perfectly cooked meat. Locals know to get them Hass style—or served with green chili verde and cheese—for the ultimate experience. You don’t need to be in southern Arizona to enjoy authentic Mexican tacos. Tacos Los Altos serves up some seriously delicious tacos all the way up in Flagstaff. They sell a variety of tasty tacos including favorites like the fish taco and carne asada with guacamole and cheese. Try the carne asada fries for starchy goodness with a taco taste. No matter your preference, every menu item is fresh, tasty, and served with a hefty portion of meats and toppings. The Taco Shop is a hole-in-the wall that serves up their delicious tacos 24/7. Located near the University of Arizona, it’s a favorite among the late-night college crowd. You can’t go wrong no matter your taco selection. They sell beef, chicken, and fish tacos on fresh and crispy tortillas. The salsa bar is loaded with homemade salsas and spicy concoctions that add an extra kick to your tacos. You’ll want to head to the Taco Shop after a night out for these cheap, tasty tacos. Soft or hard shell. Fish or shrimp tacos. These are the kind of tough questions you’ll be faced with at Mucha Lucha. This Tempe taco shop is designed in a similar fashion to Chipotle. You’ll order at the counter before carefully selecting your meat and added toppings. Their spicy, hot and sweet salsas make for a perfect blend of flavors. One word of caution—their hot sauce is no joke. You’re better off keeping it on the side to avoid mind sweltering heat. Barrio Queen is a trendy taqueria in Old Town Scottsdale. Their menu is chock full of delicious tacos that are best sampled in bunches. Some of Barrio Queen’s best tacos include chorizo, al pastor, pork chile verde, shrimp, and the egg topped carne asada y huevo. Top off your meal with some chips and tableside guacamole with pomegranate seeds for a true taste of Mexico. If you want to go all out, head to Barrio Queen on Tuesday. In honor of Taco Tuesday, each taco is discounted and costs only $2.50.